I always encourage private pilots to get their instrument rating. The training will make you a better pilot and once you get your instrument rating, it can increase the utility of your pilots license (how many times have you canceled a VFR flight because of a thin low layer of clouds?). 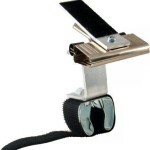 This page is meant as a short introduction to instrument training. There are a few things you will need for training that you probably didn’t need during your private pilot training. Below, I talk about the basic items. As always, I recommend you start with inexpensive options and find out what works for you with experience. 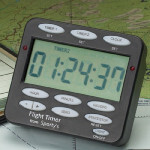 Timer – students need to get in the habit of timing certain segments of their flight. 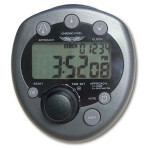 A timer can be as simple as a kitchen timer, but aviation timers will generally have other useful features, like multiple presets for count d own timing, visual and audio indicators, and GMT clock. Models from ASA and Sporty’s have worked well. Your plane may have a timer built in, but I still recommend carrying a timer. I find a watch or smartphone doesn’t work that well. View limiting device – I keep two different kinds with me at all times for my primary students. Once students begin their instrument training, they should get their own. Hoods, foggles, etc. come in a variety of styles. None are perfect, but I prefer ones that are small and easily packable and allow you to quickly transition from instruments to visual. I personally have glasses, so I use a type that clips on to most prescription glasses and flips up and down. They work well, but are extremely fragile, so I have a small box that I put them in every time I’m not using them: The other kind that I use slip on and off like glasses and have a clear section at the inner and lower edge where you look through. 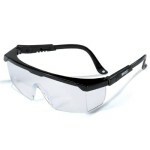 They are available in tints, but I find the clear works best. 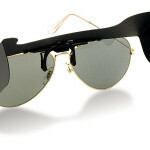 Since you are looking through a lens, you need to protect them from scratches. I’ve added a third style to my recommended list (2016) – Viban view limiting device. The seems reasonably durable and work ok with glasses and without. I used to recommend Jepp Shades, but I have found them too fragile in their recent incarnations. Organizer – kneepad, notebook, and/or chart clip. Instrument training is a paper (or at least information) rich environment. You need access to enroute charts, approach procedures, note taking, and timer. Each pilot needs to find a method for organization that works for them. I personally attach my timer to a chart clip that attaches easily to the yoke and puts it front and center, along with a paper chart. If I go electronic, I carry a small tablet on my lap, along with a small notebook. 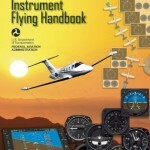 Training Materials – the cheapest route is to download the Instrument Flying Handbook (don’t forget errata) and the Instrument Procedures Handbook for free from the FAA. If you prefer paper, they can we purchased for less than $20 each. The Jeppesen Instrument Commercial Manual is a great option, but quite a bit more expensive. If you prefer a video or app approach to learning, I can recommend the Sporty’s courses on DVD or in app format. TSA – for non-US citizens, you must complete a new TSA application and receive approval prior to starting your instrument training. If you received a TSA clearance for your private pilot training, this process should go a little faster (typically you don’t need a new set of fingerprints), but still costs the same application fee. Cross country PIC – 50 hours of cross-country (meeting the 50nm requirement) PIC time is required. That means that your solo cross country time is included, but your dual cross country flights during your private training are not included. Some of this can be acquired as a part of your instrument training, but I suggest that the majority be done before, or in parallel with your training. Instrument time – you need a minimum of 40 hours of experience in simulated (hood) or actual IMC conditions. Only 15 hours of must be with an instructor (CFII). The remainder can be done with a safety pilot, but I see the majority of pilots getting the 40 hours with an instructor. Long IFR cross-country – the rules require a cross-country flight of at least 250 nm, flying under IFR (the rules… not necessarily actual conditions). Your must fly at least 3 different types of instrument approaches (e.g., an ILS, VOR, and GPS). While it does not specifically say, it makes the most sense for you to go to at least 2 other airports on the flight with a landing at each. Most pilots who plan this flight seriously underestimate the time necessary to fly the approaches, land, taxi, and get a clearance. With the fuel capacity of trainer aircraft, a fuel stop may be required in order to maintain IFR fuel minimums. My most common route is KEMT-KBFL-KSBA-KEMT, with lunch and a fuel stop at Santa Barbara. This route will often have us fly a STAR (Standard Terminal Arrival Route) and picking up clearances from clearance delivery. Some pilots have elected to include a non-towered airport for the experience of picking up a clearance at a non-towered airport. I’ve also had two friends training for their instrument rating who combined their IFR cross-country flights on one day to allow us to fly new destinations further from home (as far as KOAK). I recommend completing this requirement once you’ve become comfortable in setting up for and flying approaches, as well as communicating. Actual time – surprisingly, there is no requirement for a pilot working on his instrument rating to have ever flown through a cloud (aka, actual conditions). In SoCal, especially at certain times of the year, we can go months without any chance of instrument conditions. As a result, I always tell students we should fly in actual if the opportunity arises. Flying under the hood helps you work on your instrument scan, but most pilots agree there’s something different about flying when you know visual reference is not available simply by flipping up your hood. SoCal is blessed with a variety of airports and approaches, along with controllers that are usually helpful in getting you your requested approaches (if you know what you’re doing). Nearly all of the training here can be done within 30 miles of EMT.